Phil, Sarah, Tim, Wayne and Karen with their catch! Big Mahalo to Phil, Sarah, Tim, Wayne and Karen for choosing Maggie Joe Sport Fishing! 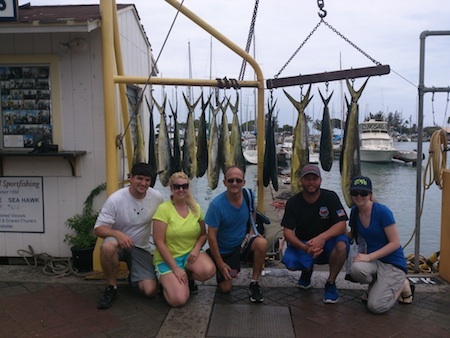 They joined Captain Matt aboard the Ruckus and were able to bring home a boatful of Mahi Mahi. Aloha! Janice, Clint, Travis, Mike, Matt and Ian with their catch! 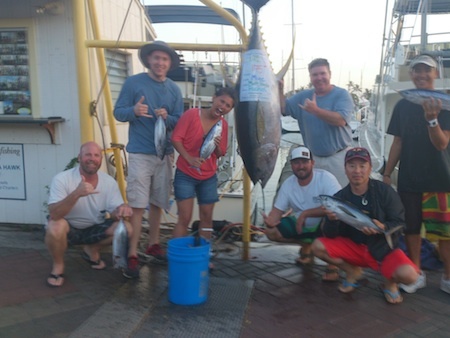 Mahalo to Janice, Clint, Travis, Mike, Matt and Ian for choosing Maggie Joe Sport Fishing! 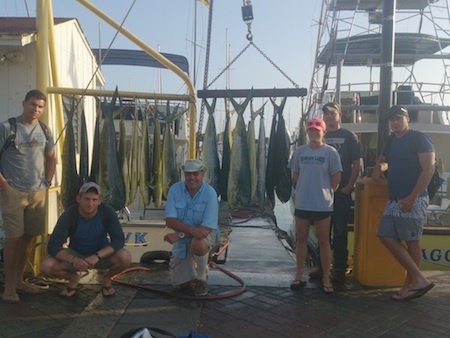 They hauled in a boatful of Mahi Mahi while deep sea fishing aboard the Maggie Joe. Aloha! Big Mahalo to Alex Jones for choosing Maggie Joe Sport Fishing. He hauled in this nice 380 lb Blue Marlin while deep sea fishing aboard the Maggie Joe! Aloha! Tim, Danielle, Troy, Nick, Rilee and Raegen with their catch! 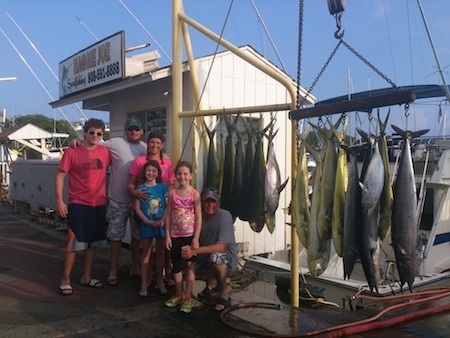 Big Mahalo to Tim, Danielle, Troy, Nick, Rilee and Raegen for choosing Maggie Joe Sport Fishing! They joined Captain Mike and Mate Morgan aboard the Maggie Joe on a sport fishing charter. They hauled in a boatful of Mahi Mahi’s, Ono’s and Tuna’s while deep sea fishing off Honolulu, Oahu. Aloha! Mike, Rod, Sharon, Bill and Katsuhide with their catch! Mahalo to Mike, Rod, Sharon, Bill and Katsuhide for choosing Maggie Joe Sport Fishing! They joined Captain Mark aboard the Ruckus and hauled in a nice Ahi and a handful of other Tunas. Aloha! 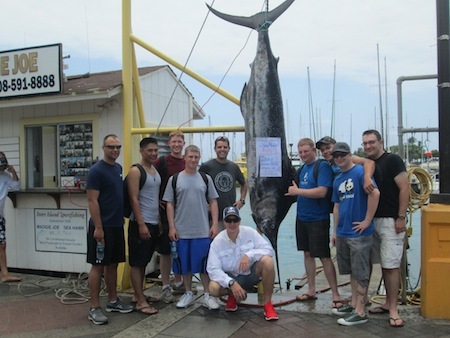 Big Mahalo to Ryan, Zac, Dwight, Suzanne, Seth and Brendin for choosing Maggie Joe Sport Fishing! They joined Captain Darryl aboard the Sea Hawk on a shared sport fishing charter. 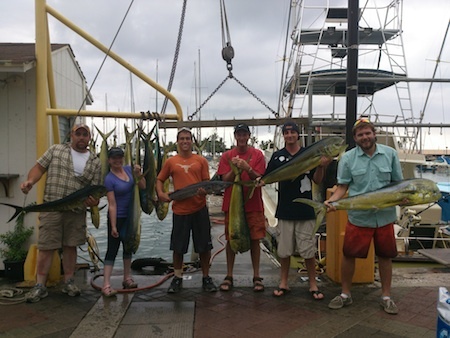 The haul: 18 Mahi Mahi and 1 Ono… awesome job guys!